Unlike the picture above of one of our customers who is doing things right, there are many times driving on the road I've seen business vans with a name, no website and a hotmail, gmail, yahoo or aol email address and it makes me think how unprofessional, out of date or general it seems. This makes me wonder how many businesses don't consider their brand or online digital marketing channels of their businesses, and perhaps you're a long established company that doesn't need to rely on marketing online, but I would challenge that thought process and hence why I thought I would write this post. This means digitally to market your business online, so for websites, mobile phones, social media. So although marketing your business online is a challenge, if everyone out there is doing this and driving traffic and customers, why not consider this in 2017. Maybe you've been established for many years and don't have a website with your branded emails, but your hesitating to change as customers know about your historic email. This is a valid point, however, think how much more effective, and relevant having a branded business email address would be that relates to your business brand name. Read below the benefits of marketing your business online. Why should I change what I've been doing for years? Years ago many businesses were primarily advertised in newspapers, business directories etc, but times move on and nowadays every business should be online with a brand that's recognisable. A business should have a website along with a branded business email address, so if your website was www.fredblogs.co.uk then rather than having a hotmail address etc, setup an email that relates to your brand such as info@fredblogs.co.uk . 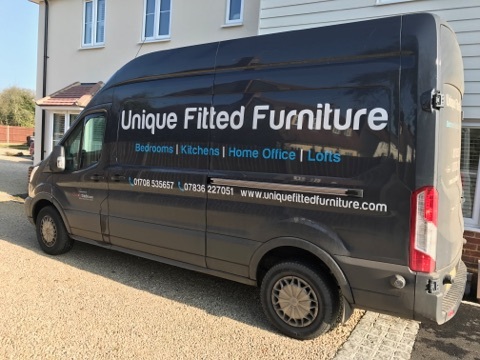 This will be more memorable than a random email address and could likely lead to return business through people remembering your services, brand etc... One of our customers www.uniquefittedfurniture.com is a good example of this as they have a website, a brand name that's memorable and they have their brand plastered on their trade van. We created their website and they now have a digital marketing channel that gives their customers relevant information online, gives the customer trust and confidence in their website and produces enquiries online. If you search online for businesses like yours, you will likely see other businesses that are perhaps direct competitors doing more online than you could be. Anyone serious about a business nowadays will have a website, branded email addresses and will be wanting to explore the variety of online channels to promote their business. No matter if you've just setup a business or been established for 10, 20, 30 years, it's essential you do what works nowadays and step out of your comfort zone. You maybe sceptical however, for getting the maximum out of your business nowadays it's good to have various channels, so if it's working, keep doing what has always worked for your business but also start to consider channels that work for your competitors. Firstly ensure you have company logo which is part of your brand identity. This is essential for a logo as it gives shows trust and professionalism, and gives people something to recognise you with. Register a domain name for your business which reflects either the name of your business or is something relevant to your industry. Get a website designed for your business as this enables you to have a central source to show your services and enable people the option to make enquiries through a contact form. This also allows you to track people visiting your website and how they got there. If you need an online presence, whether a new business or your business has been established for many years, why not plug in to the channels that work for your competition and every business out there. Speak to us today how we can assist your business with digital marketing online, web design in essex, logo design, social media and we will discuss how best to move your business forward in 2017.